The reverse bears "A pyramid unfinished. In the zenith an eye in a triangle, surrounded by a glory, proper." In addition to being the centrepiece of the Great Seal, the coat of arms is used as a national symbol on e.g. letterheads, license plates, embassies, agency seals and passports. The design on the obverse (or front) of the seal is the coat of arms of the United States. The shield, though sometimes drawn incorrectly, has two main differences from the American flag. First, it has no stars on the blue chief (though other arms based on it do: the chief of the arms of the United States Senate may show 13 or 50, and the shield of the 9/11 Commission has, sometimes, 50 mullets on the chief). Second, unlike the American flag, the outermost stripes are white, not red; so as not to violate the heraldic rule of tincture. The supporter of the shield is a bald eagle with its wings outstretched (or "displayed", in heraldic terms). From the eagle's perspective, it holds a bundle of 13 arrows in its left talon (referring to the 13 original states), and an olive branch in its right talon, together symbolizing that the United States has "a strong desire for peace, but will always be ready for war." (see Olive Branch Petition). Although not specified by law, the olive branch is usually depicted with 13 leaves and 13 olives, again representing the 13 original states. The eagle has its head turned towards the olive branch, on its right side, said to symbolize a preference for peace. In its beak, the eagle clutches a scroll with the motto E pluribus unum ("Out of Many, One"). Over its head there appears a "glory" with 13 mullets (stars) on a blue field. In the current (and several previous) dies of the great seal, the 13 stars above the eagle are arranged in rows of 1-4-3-4-1, forming a six-pointed star. The 1782 resolution of Congress adopting the arms, still in force, legally blazoned the shield as "Paleways of 13 pieces, argent and gules; a chief, azure." As the designers recognized, this is a technically incorrect blazon under traditional English heraldic rules, since in English practice a vertically striped shield would be described as "paly", not "paleways", and it would not have had an odd number of stripes. A more technically proper blazon would have been argent, six pallets gules ... (six red stripes on a white field), but the phrase used was chosen to preserve the reference to the 13 original states. The 1782 resolution adopting the seal blazons the image on the reverse as "A pyramid unfinished. In the zenith an eye in a triangle, surrounded by a glory, proper." The pyramid is conventionally shown as consisting of 13 layers to refer to the 13 original states. The adopting resolution provides that it is inscribed on its base with the date MDCCLXXVI (1776, the year of the United States Declaration of Independence) in Roman numerals. Where the top of the pyramid should be, the Eye of Providence watches over it. Two mottos appear: Annuit cœptis signifies that Providence has "approved of (our) undertakings." Novus ordo seclorum, freely taken from Virgil, is Latin for "a new order of the ages." The reverse has never been cut (as a seal) but appears, for example, on the back of the one-dollar bill. Thomson took the symbolism for the colors from Elements of Heraldry, by Antoine Pyron du Martre, which William Barton had lent him. That book claimed that argent (white) "signifies Purity, Innocence, Beauty, and Genteelness", gules (red) "denotes martial Prowess, Boldness, and Hardiness", and azure (blue) "signifies Justice, Perseverance, and Vigilance". A brief and official explanation of the symbolism was prepared in the form of a historical sketch (or pamphlet) of the seal of the United States, entitled, The Seal of the United States: How it was Developed and Adopted. It was written by Gaillard Hunt in 1892 under the direction of then Secretary of State James G. Blaine. When the copyright on the pamphlet expired, Hunt expounded upon the information in more detail. This was published in 1909 in a book titled The History of the Seal of the United States. This work was largely based on a two-volume work written in 1897 by Charles A. L. Totten titled Our Inheritance in the Great Seal of Manasseh, the United States of America: Its History and Heraldry; and Its Signification unto the 'Great People' thus Sealed. Hunt's account greatly details how the seal was chosen, containing sketches of other suggestions for a great seal which were made, such as Franklin's suggested motto "Rebellion to tyrants is obedience to God", information on the illegal seal, iterations and changes that have been made to the seal, and it also includes detailed descriptions of the symbology of the great seal (such as that provided by Charles Thomson). In honor of the fact that there were originally thirteen States in the Union, the inclusion of items consisting of this number is a common motif in the seal. The official description of the seal states that there should be thirteen stars in the "glory" above the eagle's head, thirteen stripes on the shield, and thirteen arrows in the eagle's talon. The initial description of the reverse specified thirteen levels to the pyramid, and though the number was left out of the final version, all depictions typically still show thirteen levels. Also by custom, since 1885 there are thirteen leaves and thirteen olives on the olive branch. In the Department of State, the term "Great Seal" refers to a physical mechanism which is used by the department to affix the seal to official government documents. This mechanism includes not only the die (metal engraved with a raised inverse image of the seal), but also the counterdie (also known as a counter-seal), the press, and cabinet in which it is housed. There have been several presses used since the seal was introduced, but none of the mechanisms used from 1782 through 1904 have survived. The seal, and apparently its press, was saved when Washington, D.C. was burned in 1814 though no one knows by whom. The press in use today was made in 1903 by R. Hoe & Co's chief cabinetmaker Frederick S. Betchley in conjunction with the 1904 die, with the cabinet being made of mahogany. It is marked with the contracted completion date of June 15, 1903, but delays and reworking pushed final delivery into early 1904. From 1945 to 1955, the Great Seal changed quarters almost once a year. In 1955, the seal was put on public display for the first time in a central location in the Department's main building. In 1961 the Seal became the focus of the new Department Exhibit Hall, where it resides today in a glass enclosure. The enclosure remains locked at all times, even during the sealing of a document. The seal can only be affixed by an officer of the Department of State, under the authority of the Secretary of State. To seal a document, first a blank paper wafer is glued onto its front in a space provided for it. The document is then placed between the die and counterdie, with the wafer lined up between them. Holding the document with one hand, the weighted arm of the press is pulled with the other, driving the die down onto the wafer, impressing the seal in relief. When envelopes containing letters need to be sealed, the wafer is imprinted first and then glued to the sealed envelope. It is used approximately 2,000 to 3,000 times a year. Documents which require the seal include treaty ratifications, international agreements, appointments of ambassadors and civil officers, and communications from the President to heads of foreign governments. The seal was once required on presidential proclamations, and on some now-obsolete documents such as exequaturs and Mediterranean passports. On July 4, 1776, the same day that independence from Great Britain was declared by the thirteen states, the Continental Congress named the first committee to design a Great Seal, or national emblem, for the country. Similar to other nations, the United States needed an official symbol of sovereignty to formalize and seal (or sign) international treaties and transactions. It took six years, three committees, and the contributions of fourteen men before the Congress finally accepted a design (which included elements proposed by each of the three committees) in 1782. The first committee consisted of Benjamin Franklin, Thomas Jefferson, and John Adams. While they were three of the five primary authors of the Declaration of Independence, they had little experience in heraldry and sought the help of Pierre Eugene du Simitiere, an artist living in Philadelphia who would later also design the state seals of Delaware and New Jersey and start a museum of the Revolutionary War. Each of these men proposed a design for the seal. Franklin chose an allegorical scene from Exodus, described in his notes as "Moses standing on the Shore, and extending his Hand over the Sea, thereby causing the same to overwhelm Pharaoh who is sitting in an open Chariot, a Crown on his Head and a Sword in his Hand. Rays from a Pillar of Fire in the Clouds reaching to Moses, to express that he acts by Command of the Deity." Motto, "Rebellion to Tyrants is Obedience to God." Jefferson suggested a depiction of the Children of Israel in the wilderness, led by a cloud by day and a pillar of fire by night for the front of the seal; and Hengest and Horsa, the two brothers who were the legendary leaders of the first Anglo-Saxon settlers in Britain, for the reverse side of the seal. Adams chose a painting known as the "Judgment of Hercules" where the young Hercules must choose to travel either on the flowery path of self-indulgence or the rugged, more difficult, uphill path of duty to others and honor to himself. In August 1776, Du Simitière showed his design, which was more along conventional heraldic lines. The shield had six sections, each representing "the Countries from which these States have been peopled" (England, Scotland, Ireland, France, Germany, and Holland), surrounded by the initials of all thirteen states. The supporters were a female figure representing Liberty holding an anchor of hope and a spear with a cap, and on the other side an American soldier holding a rifle and tomahawk. The crest was the "Eye of Providence in a radiant Triangle whose Glory extends over the Shield and beyond the Figures", and the motto E Pluribus Unum (Out of Many, One) in a scroll at the bottom. On August 20, 1776, the committee presented their report to Congress. The committee members chose Du Simitière's design, though it was changed to remove the anchor of hope and replace the soldier with Lady Justice holding a sword and a balance. Surrounding the main elements was the inscription "Seal of the United States of America MDCCLXXVI". For the reverse, Franklin's design of Moses parting the Red Sea was used. Congress was however not impressed, and on the same day ordered that the report "lie on the table", ending the work of the committee. 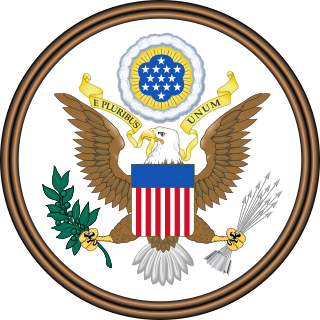 While the designs in their entirety were not used, the E Pluribus Unum motto was chosen for the final seal, and the reverse used the Roman numeral for 1776 and the Eye of Providence. Jefferson also liked Franklin's motto so much, he ended up using it on his personal seal. The motto was almost certainly taken from the title page of Gentleman's Magazine, a monthly magazine published in London which had used it from its first edition in 1731, and was well known in the colonies. The motto alluded to the magazine being a collection of articles obtained from other newspapers, and was used in most of its editions until 1833. The motto was taken in turn from Gentleman's Journal, a similar magazine which ran briefly from 1692 to 1694. While variants turn up in other places (for example a poem often ascribed to Virgil called Moretum contains the phrase E Pluribus Unus), this is the oldest known use of the exact phrase. Another source was some of the Continental currency issued earlier in 1776; these were designed by Franklin and featured the motto We Are One surrounded by thirteen rings, each with the name of a colony. This design is echoed in the seal submitted by the first committee, and the motto was quite possibly a Latin version of this concept. The Eye of Providence had been a well-known classical symbol of the deity since at least the Renaissance, which Du Simitiere was familiar with. For three and a half years no further action was taken, during which time the Continental Congress was forced out of Philadelphia before returning in 1778. On March 25, 1780, a second committee to design a great seal was formed, which consisted of James Lovell, John Morin Scott, and William Churchill Houston. Like the first committee, they sought the help of someone more experienced in heraldry, this time Francis Hopkinson, who did most of the work. Hopkinson, a signer of the Declaration of Independence, designed the American flag, and also helped design state and other government seals. He made two similar proposals, each having an obverse and reverse side, with themes of war and peace. Hopkinson's first design had a shield with thirteen diagonal red and white stripes, supported on one side by a figure bearing an olive branch and representing peace, and on the other an Indian warrior holding a bow and arrow, and holding a quiver. The crest was a radiant constellation of thirteen stars. The motto was Bello vel pace paratus, meaning "prepared in war or in peace". The reverse, in Hopkinson's words, was "Liberty is seated in a chair holding an olive branch and her staff is topped by a Liberty cap. The motto `Virtute perennis' means `Everlasting because of virtue.' The date in Roman numerals is 1776." In his second proposal, the Indian warrior was replaced by a soldier holding a sword, and the motto was shortened to Bello vel paci, meaning "For war or for peace". The committee chose the second version, and reported back to Congress on May 10, 1780, six weeks after being formed. Their final blazon, printed in Congress journals on May 17, was: "The Shield charged on the Field Azure with 13 diagonal stripes alternate rouge and argent. Supporters; dexter, a Warriour holding a Sword; sinister, a Figure representing Peace bearing an Olive Branch. The Crest; a radiant Constellation of 13 Stars. The motto, Bella vel Paci." Once again, Congress did not find the result acceptable. They referred the matter back to the committee, which did no further work on the matter. As with the first design, several elements were eventually used in the final seal; the thirteen stripes on the shield with their colors, the constellation of stars surrounded by clouds, the olive branch, and the arrows (from Hopkinson's first proposal). Hopkinson had previously used the constellation and clouds on a $40 Continental currency note he designed in 1778. The same note also used an Eye of Providence, taken from the first committee's design. The shield of the Great Seal has seven white stripes and six red ones—essentially, a white background with six red stripes. Hopkinson incorporated this stripe arrangement into the Great Seal from the Flag of the United States that he had designed. Hopkinson also designed a seal for the Admiralty (Navy), which incorporated a chevron consisting of seven red stripes and six white ones. The seven red stripes in his Admiralty seal reflected the number of red stripes in his Naval flag. When Hopkinson designed these flags, he was running the Navy as chairman of the Continental Navy Board. After two more years, Congress formed a third committee on May 4, 1782, this time consisting of John Rutledge, Arthur Middleton, and Elias Boudinot. Arthur Lee replaced Rutledge, although he was not officially appointed. As with the previous two committees, most of the work was delegated to a heraldic expert, this time 28-year-old William Barton. Barton drew a design very quickly, using a rooster on the crest, but it was much too complex. No drawing of this design seems to have survived. Barton then came up with another design, which the committee submitted back to Congress on May 9, 1782, just five days after being formed. This time, the figures on each side of the shield were the "Genius of the American Confederated Republic" represented by a maiden, and on the other side an American warrior. At the top is an eagle and on the pillar in the shield is a "Phoenix in Flames". The mottos were In Vindiciam Libertatis (In Defense of Liberty) and Virtus sola invicta (Only virtue unconquered). 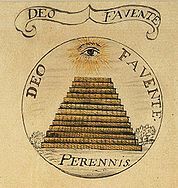 For the reverse, Barton used a pyramid of thirteen steps, with the radiant Eye of Providence overhead, and used the mottos Deo Favente ("With God favoring") and Perennis (Everlasting). 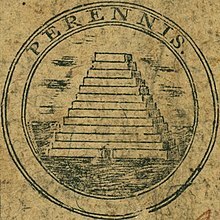 The pyramid had come from another Continental currency note designed in 1778 by Hopkinson, this time the $50 note, which had a nearly identical pyramid and the motto Perennis. Barton had at first specified "on the Summit of it a Palm Tree, proper," with the explanation that "The Palm Tree, when burnt down to the very Root, naturally rises fairer than ever," but later crossed it out and replaced it with the Eye of Providence, taken from the first committee's design. Congress again took no action on the submitted design. Thomson's report to Congress, which was accepted and is still the law today. On June 13, 1782, the Congress turned to its Secretary Charles Thomson, and provided all material submitted by the first three committees. Thomson was 53 years old, and had been a Latin master at a Philadelphia academy. Thomson took elements from all three previous committees, coming up with a new design which provided the basis for the final seal. Thomson used the eagle—this time specifying an American bald eagle—as the sole supporter on the shield. The shield had thirteen stripes, this time in a chevron pattern, and the eagle's claws held an olive branch and a bundle of thirteen arrows. For the crest, he used Hopkinson's constellation of thirteen stars. The motto was E Pluribus Unum, taken from the first committee, and was on a scroll held in the eagle's beak. An eagle holding symbols of war and peace has a long history, and also echoed the second committee's themes. Franklin owned a 1702 emblem book, which included an eagle with olive branch and arrows near its talons, which may have been a source for Thomson. The arrows also mirror those in the arms of the Dutch Republic, the only country in Europe with a representative government at the time, which depicted a lion holding seven arrows representing their seven provinces. State currency may have provided further inspiration; a 1775 South Carolina bill showed a bundle of 13 arrows and a 1775 Maryland note depicted a hand with an olive branch of 13 leaves. For the reverse, Thomson essentially kept Barton's design, but re-added the triangle around the Eye of Providence and changed the mottos to Annuit Cœptis and Novus Ordo Seclorum. Thomson sent his designs back to Barton, who made some final alterations. The stripes on the shield were changed again, this time to "palewise" (vertical), and the eagle's wing position was changed to "displayed" (wingtips up) instead of "rising". Barton also wrote a more properly heraldic blazon. The design was submitted to Congress on June 20, 1782 and was accepted the same day. Thomson included a page of explanatory notes, but no drawing was submitted. This remains the official definition of the Great Seal today. The first brass die was cut sometime between June and September, and placed in the State House in Philadelphia. It was first used by Thomson on September 16, 1782, to verify signatures on a document which authorized George Washington to negotiate an exchange of prisoners. Charles Thomson, as the Secretary of Congress, remained the keeper of the seal until the Federal government was formed in 1789. On July 24, 1789, President Washington asked Thomson to deliver the seal to the Department of Foreign Affairs in the person of Roger Alden, who kept it until the Department of State was created. All subsequent Secretaries of State have been responsible for applying the Seal to diplomatic documents. On September 15, 1789, the United States Congress ordered "that the seal heretofore used by the United States in Congress assembled, shall be, and hereby is declared to be, the seal of the United States." The metallic die of the obverse side of the Great Seal is what actually embosses the design onto documents. These dies eventually wear down, requiring replacements to be made. The current die is the seventh engraving of the seal, and the actual design on the dies has evolved over time. The first die was made of brass, and measured 2 1/16 inches in diameter while being one half inch thick. It was cut sometime between June and September 1782 (i.e. between the design being accepted and its first use), although the exact date is not known. The identity of the engraver is also not known; it may have been Robert Scot but Thomson may also have found a private engraver on his own. The first die depicts a relatively crude crested eagle, thin-legged and somewhat awkward. There is no fruit on the olive branch, and the engraver added a border of acanthus leaves. Depicting an eagle with a crest is typical in heraldry, but is at odds with the official blazon of the seal which specifies a bald eagle (which have no crests). The blazon does not specify the arrangement of the stars (which were randomly placed in Thomson's sketch) nor the number of points; the engraver chose six-pointed stars (typical of English heraldry), and arranged them in a larger six-pointed star. No drawing made by the engraver has ever been found, and it is not known if Thomson provided any. This first die was used until 1841, and is now on display in the National Archives in Washington, D.C. There was no die made of the reverse side of the seal (and in fact, one has never been made). The intended use was for pendant seals, which are discs of wax attached to the document by a cord or ribbon, and thus have two sides. However, the United States did not use pendant seals at the time, and there was no need for a die of the reverse. In an essay published in Harper's from 1856 Bernard Lossing alluded to a version half the size for the purpose of impressing wax and paper. More recent research has not been able to verify this claim, with no record of this seal being found (although the second seal committee of 1780 had recommended a half-size seal). Shortly after the first die, the Congress of the Confederation ordered a smaller seal for the use of the President of the Congress. 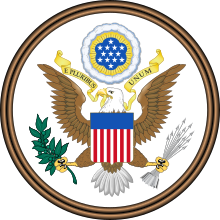 It was a small oval, with the crest from the Great Seal (the radiant constellation of thirteen stars surrounded by clouds) in the center, with the motto E Pluribus Unum above it. Benson Lossing claimed it was used by all the Presidents of the Congress after 1782, probably to seal envelopes on correspondence sent to the Congress, though only examples from Thomas Mifflin are documented. This seal's use apparently did not pass over to the new government in 1789. Today's Seal of the President of the United States, which developed by custom over a long period before being defined in law, is a more full-featured version of the Great Seal. Starting with the ratification of the Treaty of Ghent, the United States began to use pendant seals on treaties, where the seal is impressed onto a separate wax disc and attached to the document with cords. Although the reverse side of the seal was designed for this purpose, a die was still not made but rather the obverse was impressed on one side only using the regular die. However, this did not conform to the European tradition of using much larger seals for treaties. To address this, Seraphim Masi of Washington D.C., was asked to design a larger seal specifically for treaties. Masi produced a quite different design, showing a much more realistic (and uncrested) eagle, turned somewhat to the side. He also added fruits to the olive branch, changed the shape of the shield, and depicted the crest differently (though using the same arrangement of six-pointed stars). It was 4 11/16 inches in diameter. These seals were transported in metallic boxes called skippets, which protected the actual wax seal from damage. The skippets themselves also were engraved with the seal design. Several skippets were made at a time, which the State Department used as needed. Usually skippets were made out of sterling silver, though for the Japanese treaty following Commodore Perry's mission a golden box was used (the ratification of that treaty, made later in 1854, had an even more elaborate and expensive seal and heavy gold skippet). The Masi treaty die was used until 1871, almost exclusively for treaties, at which point the U.S. government discontinued the use of pendant seals. The die is also currently on display at the National Archives. Masi's company made most of the skippets for almost twenty years, after which the State Department switched to nearly identical versions made by Samuel Lewis. At least one 1871 treaty seal was actually made using a Lewis skippet mold instead of the Masi die, meaning it too is technically an official die. Over time, the original seal became worn and needed to be replaced. John Peter Van Ness Throop of Washington D.C. engraved a new die in 1841, which is also sometimes known as the "illegal seal" because only six arrows are shown rather than the required thirteen. Throop also chose to use five-pointed stars, though kept the six-pointed star arrangement, a change which has continued in all subsequent dies. Other changes include a more vigorous and uncrested eagle, the removal of the acanthus leaves, a general crowding of the design upward, a different shape to the shield, and fruit on the olive branch (four olives). The seal was 2 1/8 inches in diameter. In 1866, the first counterdie was made, which is the same design in opposite relief. The paper was placed between the die and counterdie, resulting in a sharper impression in the paper than from one die alone. The use of counterdies continues to this day. 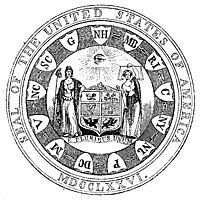 The United States Centennial in 1876 had renewed interest in national symbols, and articles appeared noting the irregularities in the 1841 seal. However, when it came time to replace the worn 1841 die, the Department of State kept the same design. The new die was engraved by Herman Baumgarten of Washington, D.C. His version followed the 1841 die very closely, including the errors, and was the same size. The most notable differences were slightly larger stars and lettering. The workmanship on the die was relatively poor, with no impression being very clear, and it is considered the poorest of all Great Seal dies. Unfortunately, it was the one in use during the seal's centennial in 1882. By early 1881 the State Department started responding to criticism of the seal, resulting first in an 1882 centennial commemorative medal, and then with Secretary of State Frederick Frelinghuysen asking for funds to create a new design and dies of both the obverse and reverse on January 11, 1884, after getting estimates of the cost. Congress eventually appropriated $1,000 for those purposes on July 7, 1884. The design contract went to Tiffany & Co.
Theodore F. Dwight, Chief of the Bureau of Rolls and Library of the Department of State, supervised the process. He brought in several consultants to consider a design from historical, heraldic, and artistic points of view. These included Justin Winsor, a historical scholar, Charles Eliot Norton, a Harvard professor, William H. Whitmore, author of Elements of Heraldry, John Denison Chaplin, Jr., an expert on engraving and associate editor of American Cyclopædia, the sculptor Augustus Saint-Gaudens, the Unitarian minister Edward Everett Hale, and even the botanist Asa Gray to help with the olive branch. Tiffany's chief designer, James Horton Whitehouse, was the artist responsible for the actual design. On December 13, 1884, following much research and discussion among the group, Whitehouse submitted his designs. The result was a much more formal and heraldic look, completely different from previous dies, and has remained essentially unchanged since. The eagle is a great deal more robust, and clutches the olive branch and arrows from behind. The 13 arrows were restored, in accordance with the original law, and the olive branch was depicted with 13 leaves and 13 olives. The clouds surrounding the constellation were made a complete circle for the first time. The resulting die was made of steel, was 3 inches (76 mm) wide, and weighed one pound six ounces. In a letter accompanying their designs, Tiffany gave their reasonings behind various elements. The eagle was made as realistic as the rules of heraldry would permit, and the scroll style was chosen to least interfere with the eagle. There were no stars in the chief (the area at the top of the shield), as is sometimes seen, as there are none specified in the blazon and thus including them would violate the rules of heraldry. Some had suggested allowing the rays of the sun to extend through the clouds, as appears to be specified in the original law and sometimes seen in other versions, but Whitehouse rejected that idea and kept with the traditional die representation. He also considered adding flowers to the olive branch, but decided against it, as "the unspecified number of flowers would be assumed to mean something when it would not". Tiffany also submitted a design for the reverse of the seal, but even though Congress had ordered one a die was not created. The members of the consulting group were somewhat disparaging of the design of even the obverse, but especially critical of the reverse, and suggested not making it at all. Dwight eventually agreed and did not order the die, though he said it was "not improper" that one eventually be made. To this day, there has never been an official die made of the reverse. After only 17 years, the seal was no longer making a good impression (probably due to a worn counterdie). On July 1, 1902, Congress passed an act to appropriate $1250 to have the seal recut. There was some discussion among State Department officials whether to redo the design again, but given the thought that had gone into the 1885 version, it was decided to recreate that design. Congress renewed the law on March 3, 1903, since no action had yet been taken, and this time specified that it be recut from the existing model which ended any further discussion. The die was engraved by Max Zietler of the Philadelphia firm of Baily Banks & Biddle in 1903 (and is thus sometimes called the 1903 die), but final delivery was delayed until January 1904 due to issues with the press. There were slight differences; the impressions were sharper, the feathers more pointed, and the talons have shorter joints. Also, two small heraldic errors which had persisted on all previous seal dies were fixed: the rays of the glory were drawn with dots to indicate the tincture gold, and the background of the stars was drawn with horizontal lines to indicate azure. The die was first used on January 26, 1904, and was used for 26 years. All dies made since have followed exactly the same design, and in 1986 the Bureau of Engraving and Printing made a master die from which all future dies will be made. The current die is the seventh, and was made in 1986. In 1894 Palemon Howard Dorsett, a lifelong Department of Agriculture employee, turned up at the Department of State with a metal die engraved with the Great Seal, claiming it had originally been given to his family by a nephew of George Washington. It was examined by Gaillard Hunt, the author of a pamphlet on the Great Seal, who agreed that it appeared to be contemporaneous with the original 1782 seal, but he took no further interest in the matter. Decades later, in 1936, Dorsett wrote again regarding his die, and this time it was investigated more thoroughly. It is a very similar design to the first Great Seal die and obviously copied from it, even including a border of acanthus leaves. The eagle was different though, being more spirited with its wings more widely spread. More significantly, the arrows and the olive branch are switched, indicating an intentional "difference" to distinguish it from the actual Great Seal. It is the same size as the first die, and is made of bronze. There was no indication that it could actually be used in a seal press, and a search of government documents showed no use of the seal anywhere. The investigation also turned up some facts that supported Dorsett's story: documents relating to the sale of Washington's estate list "plates arms U.S." being sold to Thomas Hammond (a son-in-law of Charles Washington and therefore a nephew by marriage to George Washington), and also the Hammond and Dorsett families both had roots in West Virginia just a few miles apart. Afterwards Dorsett lent his seal to Mount Vernon, and his heirs made it a donation. It was eventually put on display in a museum there. The origins and purpose of this die remain unknown. Both Hunt and the authors of Eagle and the Shield speculate it was meant to be used by either the President of the Congress or later by the President of the United States, but there is no other evidence to support this. In October and November 2007, two more dies were discovered in Rhode Island with exactly the same design (though cut in relief), even down to the same small flaws. They were made of silver-plated lead, which is sometimes used as an engraving test since it is a cheaper metal. The Great Seal very quickly became a popular symbol of the country. Combined with the heraldic tradition of artistic freedom so long as the particulars of the blazon are followed, a wide variety of official and unofficial emblazonments appeared, especially in the first hundred years. This is evident even in the different versions of the seal die. The quality of the 1885 design, coupled with a spirit of bureaucratic standardization that characterized that era, has driven most of these out of official use. 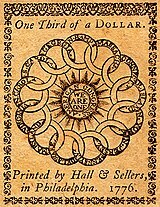 In 1786, for the first two issues of Columbian Magazine, Philadelphia engraver James Trenchard wrote articles on the obverse (in September 1786) and reverse (in October 1786) of the Great Seal, and each issue included a full-page engraving of his own original version of the discussed side of the seal. The project apparently was aided by William Barton, as the official law was printed along with supplemental notes from Barton. Trenchard's obverse featured randomly placed stars, like Thomson's drawing, and had the rays of the glory extending beyond the clouds upward, with the clouds themselves being in an arc. The reverse also followed the blazon carefully, and featured an elongated pyramid with the requisite mottos and the Eye of Providence (a right eye, unlike versions that followed). While not official, Trenchard's depiction had an obvious influence on subsequent official versions, and was the first known public rendering of the reverse side (and only one for many years). St. Paul's Chapel in New York City has a large oil painting of the national coat of arms, believed installed sometime in 1786. It was commissioned on October 7, 1785, not long after the Congress of the Confederation began meeting in nearby Federal Hall. The painting hangs over Washington's pew, across the room from a painting of the arms of New York over the Governor's pew. The painting has many similarities to Trenchard's version (or vice versa depending on which came first), including the random placement of stars and details of the eagle. The clouds are in a full circle, though, instead of an arc, and the rays extend beyond them in all directions. The shield has a gold chain border with a badge at the bottom. This is the earliest known full-color version of the seal design, and the artist is unknown. European powers had traditionally given "peace medals" to Native American Indians in an attempt to curry favor, and the newly created United States followed suit. On April 28, 1786, the Congress authorized creation of Indian Peace Medals with the coat of arms (obverse of the Great Seal) on one side, and various designs on the other. The medals were typically oval and made of silver, and were fairly large. The use of the arms on these medals continued through 1795, with the more famous ones having a scene with George Washington on the other side. Medals made after this time used other designs, and the practice continued through the administration of Benjamin Harrison. The design of the arms on these medals, made by the U.S. Mint, follow the Trenchard design very closely. The stars are randomly placed, the clouds form an arc, with the rays of the glory upward and outwards, a design reminiscent of the modern-day Seal of the President of the United States. In 1790 it was decided to award diplomatic medals to foreign envoys at the end of their service, as a less-extravagant version of the European custom to give diplomats expensive gifts upon their departure. Thomas Jefferson (then the Secretary of State) instructed the U.S. chargé d'affaires in Paris (William Short) to contract with a local engraver to make the medals, since the first was to go to the Marquis de la Luzerne, the former French minister. Jefferson specified that one side must be the Arms of the United States, and gave suggestions for the other side though left the final decision to Short and the engraving artist. Short chose Augustin Dupré, a leading engraver of the time, who completed the medals in 1792. Dupré created an elegant design, especially interesting for the position of the wings, which are more horizontal ("extended" in heraldic terms) than most other emblazonments. The eagle itself was unmistakably a bald eagle, without a crest. The five-pointed stars were arranged in a six-pointed star pattern (like the future 1841 die). The clouds are in an inverted arc, much like the official die, but the rays of the glory extend down beyond the clouds and in back of the eagle. Dupré added a UNITED STATES OF AMERICA legend around the sides, and a small rosette of leaves in the exergue below the eagle. For the reverse, Dupré apparently followed one of Jefferson's suggestions, depicting a scene of international commerce portrayed as Mercury (the god of diplomacy) in conference with the genius of America (shown as an Indian chief, similar to some early American copper coins). Only two medals (both made of gold) were given before the practice was terminated, one posthumously to de la Luzerne and the other to his successor Count de Moustier. Six bronze versions were also delivered to William Short. Their existence was eventually forgotten until the 1870s, when references to the medals in Jefferson's papers were connected to the discovery of Dupré's lead working model. The reverse side of the Great Seal of the United States, as seen in Freedom Plaza. In 1776 the continental congress adopted a resolution calling for the creation of a seal for the new nation. In June 1782 the United States Congress approved a design which was manufactured in September of that year. In early 1881 the Department of State selected a new design for the obverse, which was made in 1885. 2,000 to 3,000 times a year the seal is used on treaties and other international agreements; proclamations, and commissions of ambassadors, foreign service officers, and all other civil officers appointed by the President. In addition we see the seal design every day on the back of the one dollar bill. This inscription honors both the history, and the modern functionality of the Great Seal, especially in regards to its use by the Department of State. The Coinage Act of 1792 established the U.S. Mint and created the U.S. system of currency, and most of its rules were followed for many years. Among them was a basic design for any gold or silver coins; the obverse was required to have an "impression emblematic of liberty", with the reverse having a "figure or representation of an eagle". While using a depiction of the national arms was not necessary, various different arms designs were often used until the early 1900s, and still sometimes appear today on commemorative coins. Even before the mint, the 1787 Brasher Doubloon had a depiction of the arms on one side. When the U.S. government moved back to Philadelphia in 1790, the city, in an attempt to convince the federal government not to move to Washington, was determined to provide luxurious accommodations at Congress Hall, the recently constructed building where Congress was to meet. One of the finishing touches was in June 1791, when a large Axminster carpet was installed in the Senate's upper-floor chamber. The central design was the U.S. coat of arms, complete with the constellation of 13 stars, surrounded by the linked shields of all thirteen states. Under the arms, there was also a pole with a liberty cap and a balance of justice. The carpet was 22 by 40 feet, and was made by William Peter Sprague, an Englishman from Axminster (probably trained under Thomas Whitty) who had set up a factory in Philadelphia. The carpet was not brought to Washington, D.C., when the government moved in 1800, and is long lost. The National Park Service had a reproduction made in 1978 as part of the restoration of Congress Hall; they had to speculate on the exact design of the eagle and chose the representation seen on the first seal die. In the July 1856 Harper's New Monthly Magazine, historian Benson John Lossing wrote an article on the Great Seal. To illustrate the article, along with copies of Hopkinson's and Barton's original drawings and his own interpretations of the first committee's designs, he also included an apparently original version of the reverse. This depiction more resembles the Egyptian pyramids, and changed the Eye of Providence to a left eye. Lossing's reverse has heavily influenced all future renditions, including today's official version. In February 1882, C. A. L. Totten (then a 1st lieutenant in the U.S. Army) wrote to both the Secretaries of State and Treasury to suggest some sort of commemoration for the Great Seal, which was to have its centennial later that year, in particular including a version of the never-cut and rarely seen reverse side. The State Department demurred, but the Treasury Department (having the ability to act without express permission of Congress) decided that a commemorative medal would be appropriate and agreed to make one later that year. The medal was designed by Charles E. Barber, the chief engraver of the U.S. Mint. For the obverse, Barber primarily used Trenchard's 1786 Columbian Magazine version, but replaced the eagle with the superior one from Dupré's 1792 Diplomatic Medal (which had been rediscovered a few years before). For the reverse, Barber directly copied Trenchard's 1786 design. According to Totten, two proofs were made in time for the June 20, 1882, centennial date with general circulation following in October 1882. This was the first time a design for the reverse had been officially issued by the U.S. government. The first design of the 1935 $1 Silver Certificate with Roosevelt's change instructions, and the finished design as seen on a 2007 Federal Reserve Note. According to Henry A. Wallace (then the Secretary of Agriculture in President Franklin D. Roosevelt's cabinet), in 1934 he saw a 1909 pamphlet on the Great Seal by Gaillard Hunt. The pamphlet included a full-color copy of the reverse of the Great Seal, which Wallace had never seen. He especially liked the motto Novus Ordo Seclorum ("New Order of the Ages"), likening it to Roosevelt's New Deal (i.e., "New Deal of the Ages"). He suggested to Roosevelt that a coin be made which included the reverse, but Roosevelt instead decided to put it on the dollar bill. The initial design of the bill had the obverse on the left and the reverse on the right, but Roosevelt ordered them to be switched around. The first bill to contain both sides of the seal was the series 1935 $1 silver certificate. The obverse had originally appeared on the back of the $20 gold certificate, Series 1905. In 2008, the redesigned front side of the five-dollar bill added a purple outline of the obverse of the Great Seal as a background, as part of freedom-related symbols being added to redesigned bills. On August 4, 1945, a delegation from the Young Pioneer organization of the Soviet Union presented a carved wooden plaque of the Great Seal to U.S. Ambassador W. Averell Harriman, as a "gesture of friendship" to the USSR's allies of World War II. Concealed inside was a covert remote listening device called The Thing. It hung in the ambassador's Moscow residential study for seven years, until it was exposed in 1952 during the tenure of Ambassador George F. Kennan. Today's official versions from the Department of State are largely unchanged from the 1885 designs. The current rendering of the reverse was made by Teagle & Little of Norfolk, Virginia, in 1972. It is nearly identical to previous versions, which in turn were based on Lossing's 1856 version. 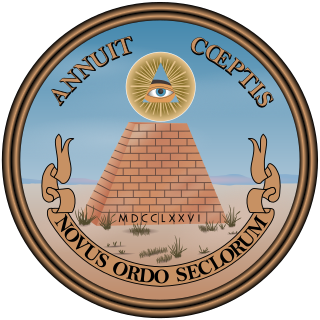 Some conspiracy theories state that the Great Seal shows a sinister influence by Freemasonry in the founding of the United States. Such theories usually claim that the Eye of Providence (found, in the Seal, above the pyramid) is a common Masonic emblem, and that the Great Seal was created by Freemasons. These claims, however, misstate the facts. While the Eye of Providence is today a common Masonic motif, this was not the case during the 1770s and 1780s (the decades when the Great Seal was being designed and approved). According to David Barrett, a Masonic researcher, the Eye seems to have been used only sporadically by the Masons in those decades, and was not adopted as a common Masonic symbol until 1797, several years after the Great Seal of the United States had already been designed. The Eye of Providence was, on the other hand, a fairly common Christian motif throughout the Middle Ages and Renaissance, and was commonly used as such in Europe as well as America throughout the 18th century. It is still found in Catholic, Orthodox, and even some Protestant churches, and it symbolises the Holy Trinity (the triangle) and God's omniscience (the eye) surrounded by rays of glory, denoting God's divinity. Furthermore, contrary to the claims of these conspiracy theories, the Great Seal was not created by Freemasons. While Benjamin Franklin was a Mason, he was the only member of any of the various Great Seal committees definitively known to be so, and his ideas were not adopted. Of the four men whose ideas were adopted, neither Charles Thomson, Pierre Du Simitière nor William Barton were Masons and, while Francis Hopkinson has been alleged to have had Masonic connections, there is no firm evidence to support the claim. ^ a b c d e f g h i j k l m n o p q r s t u v w x y z aa ab ac ad ae af ag ah ai aj ak al Bureau of Public Affairs. "The Great Seal of the United States" (PDF). U.S. Department of State. Retrieved February 3, 2009. ^ a b "The Arms of the United States: Criticisms and Rebuttals". The American Heraldry Society. Retrieved September 30, 2017. ^ "A Turn of the Head". snopes.com. ^ MacArthur, John D. "Source of NOVUS ORDO SECLORUM". greatseal.com. ^ As quoted by MacArthur, John D. "Explanation of the Great Seal's Symbolism". greatseal.com. ^ Patterson, Richard Sharpe; Dougall, Richardson (1978) [1976 i.e. 1978]. The Eagle and the Shield: A History of the Great Seal of the United States. Department and Foreign Service series ; 161 Department of State publication ; 8900. Washington : Office of the Historian, Bureau of Public Affairs, Dept. of State : for sale by the Supt. of Docs., U.S. Govt. Print. Off. pp. 80–81. LCCN 78602518. OCLC 4268298. ^ a b c d e Hunt, Gaillard. "The History of the Seal of the United States". Washington, D.C.: Department of State, 1909 1st Ed. Page 5. ^ "Uncle Sam Has Seal Maker in the Library of Congress". Magazine. The Washington Herald. March 2, 1913. p. 3 – via Chronicling America: Historic American Newspapers, Library of Congress. ^ a b "Keeping the Seal in Good Hands". U.S. Diplomacy Center. Retrieved February 3, 2009. ^ "Great Seal Fact Sheet". Retrieved February 3, 2009. ^ "Redefining the Seal's Use". and "Using the Seal as the Nation Expands". U.S. Diplomacy Center. Retrieved February 3, 2009. ^ a b MacArthur, John D. "First Great Seal Committee: July–August 1776". greatseal.com. Retrieved February 3, 2009. ^ a b c d e f "The Arms of the USA: Development of the Design". Archived from the original on June 24, 2009. Retrieved February 3, 2009. ^ a b "Official Heraldry of the United States". Retrieved February 3, 2009. ^ a b c "The Arms of the USA: Blazon and Symbolism". Archived from the original on October 17, 2007. Retrieved February 3, 2009. ^ a b Totten, C.A.L. The Seal of History, Vol II. pp. 122–3. ^ Jordan, Louis. "Continental Currency: February 17, 1776". University of Notre Dame. Retrieved February 3, 2009. ^ a b MacArthur, John D. "Symbols of Unity on Continental Currency". greatseal.com. Retrieved February 3, 2009. ^ a b The Eagle and the Shield, p. 531. Some examples include the Holy Trinity Column in Olomouc, Czech Republic built from 1716–1754 (seen here), the Gate of Dawn in Vilnius, built between 1503 and 1522 (seen here), the Aachen Cathedral (seen here, inscription dated 1766), the cover of a 1762 book by Giovanni Battista Morgagni, or the 1789 French Declaration of the Rights of Man and of the Citizen (seen here). ^ a b c d e f g h i j k Totten, C.A.L. (1897). The Seal of History. 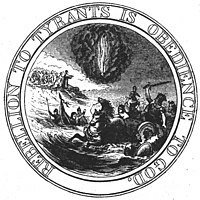 New Haven, Connecticut: The Our Race Publishing Co.
^ a b c MacArthur, John D. "Second Great Seal Committee: March 1780". greatseal.com. Retrieved February 3, 2009. ^ The Eagle and the Shield, pp. 34–35 "He created the American flag that Congress adopted on June 14, 1777." ^ Williams, Jr., Earl P. (October 2012). "Did Francis Hopkinson Design Two Flags?" (PDF). NAVA News (216): 7–9. Retrieved February 16, 2017. ^ a b c d e MacArthur, John D. "Third Great Seal Committee: May 1782". greatseal.com. Retrieved February 3, 2009. ^ MacArthur, John D. "Third Great Seal Committee Blazon". greatseal.com. Retrieved February 3, 2009. ^ a b c MacArthur, John D. "The Final Design of the Great Seal: June 20, 1782". greatseal.com. Retrieved February 3, 2009. ^ a b c d e f g h Hunt, Gaillard (1909). The History of the Seal of the United States. Washington, D.C.: United States Department of State. OCLC 2569489. ^ Chap. XIV. 1 Stat. 68 from "A Century of Lawmaking for a New Nation: U.S. Congressional Documents and Debates, 1774–1875". Library of Congress, Law Library of Congress. Retrieved March 24, 2012. ^ a b c d e f g h i McMillan, Joseph. "The Arms of the USA: Artistic Expressions". americanheraldry.org. Archived from the original on June 24, 2009. Retrieved February 3, 2009. ^ Lossing, Benson J. (July 1856). "Great Seal of the United States". Harper's New Monthly Magazine. 13 (74): 184–5. Congress then ordered a seal half the size of the great one, to impress wax and paper, as you now see it upon this commission signed by my old and trusty friend, Charles Thomson. ^ The Eagle and the Shield, p. 564 See footnote 29. "No evidence has been found to substantiate this statement either, although the report of the second seal committee in 1780 (which was not adopted) recommended a half-size seal." ^ Lossing, Benson J. (July 1856). "Great Seal of the United States". Harper's New Monthly Magazine. 13 (74): 184–5. They also ordered a smaller seal for the use of the President of the Congress. It was small oval about an inch in length, the centre covered with clouds surrounding a space of open sky, on which were seen thirteen stars. ^ MacArthur, John D. "Official Dies of the Great Seal of the United States". greatseal.com. Retrieved February 3, 2009. ^ a b c MacArthur, John D. "The Mystery of George Washington and the Dorsett Seal". greatseal.com. Archived from the original on January 25, 2013. Retrieved February 3, 2009. ^ Anderson, Susan H. "Elements of Design in the Senate's Carpet". The Most Splendid Carpet. National Park Service. OCLC 06279577. ^ MacArthur, John D. "The First Painting of the Great Seal of the United States". greatseal.com. Retrieved February 3, 2009. ^ "Photo: Great Seal of the United States found in Freedom Plaza [front]". The Keys to The Lost Symbol: Photo Gallery. WikiFoundry. Retrieved March 29, 2017. 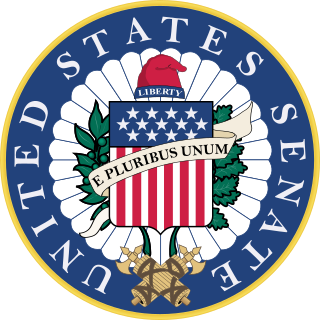 ^ Anderson, Susan H. "A Masterpiece for the Senate". The Most Splendid Carpet. National Park Service. OCLC 06279577. ^ MacArthur, John D. "How the Great Seal Got on the One-Dollar Bill". greatseal.com. Retrieved February 3, 2009. ^ a b "Bureau of Engraving and Printing FAQ Library". Archived from the original on May 5, 2015. Retrieved January 16, 2011. ^ About the $5 Federal Reserve Note U.S. Currency Education Program (https://uscurrency.gov). Retrieved on June 7, 2016. ^ Matt Soniak (June 21, 2016). "How a Gift from Schoolchildren Let the Soviets Spy on the U.S. for 7 Years". Atlas Obscura. ^ The vector version of the obverse at the top of this article was taken from U.S. government publications, while the vector reverse was made by a Wikipedia contributor and patterned after this official one. ^ "Masonic Dollar?". Freemasons-freemasonry.com. Retrieved December 26, 2013. ^ "Do the Illuminati Really Exist?". Angels & Demons from the Book to the Movie FAQ. Center for Studies on New Religions. Retrieved May 25, 2009. ^ "Associated Press story, Tuesday, February 12, 2008 as hosted by". Foxnews.com. February 12, 2008. Retrieved December 26, 2013. ^ MacArthur, John D. "Is the Pyramid & Eye a Masonic Symbol on the Great Seal and Dollar Bill?". greatseal.com. Retrieved August 5, 2018. ^ Design by King & Associates (www.edking.com). "the Masonic Service Association". Msana.com. Archived from the original on November 15, 2013. Retrieved December 26, 2013. 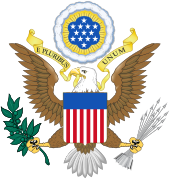 Wikimedia Commons has media related to Great Seal of the United States. Francis Hopkinson designed the first official American flag, Continental paper money, and the first U.S. coin. He was an author, a composer, and one of the signers of the Declaration of Independence in July 1776, as a delegate from New Jersey. He served in various roles in the early United States government including as a member of the Second Continental Congress and chairman of the Navy Board. He also later served as a federal district judge in Pennsylvania after the ratification of the Federal Constitution. The Coat of arms of the Philippines (Spanish: Escudo de Filipinas) features the eight-rayed sun of the Philippines with each ray representing the eight provinces which were placed under martial law by Governor-General Ramón Blanco during the Philippine Revolution, and the three five-pointed stars representing the three primary geographic regions of Luzon, Visayas, and Mindanao. The Eye of Providence is a symbol, having its origin in Christian iconography, showing an eye often surrounded by rays of light or a glory and usually enclosed by a triangle. It represents the eye of God watching over humanity. In the modern era, a notable depiction of the eye is the reverse of the Great Seal of the United States, which appears on the United States one-dollar bill. 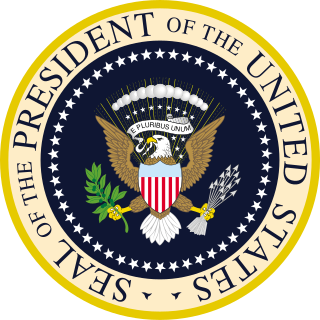 The Seal of the President of the United States is used to mark correspondence from the president of the United States to the U.S. Congress, and is also used as a symbol of the presidency itself. The central design, based on the Great Seal of the United States, is the official coat of arms of the U.S. presidency and also appears on the presidential flag. 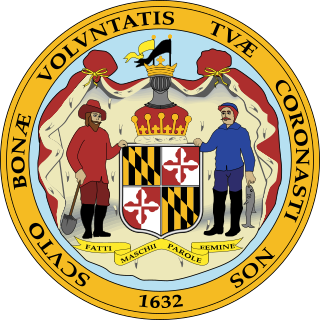 The Great Seal of the State of Maryland is the official government emblem of the U.S. state of Maryland. Its official service is to authenticate acts by the General Assembly of Maryland, but it is also used for display purposes at most state buildings. Although the state seal has been changed in design several times throughout history, the current model represents the reverse side of the original seal. William Barton was a Pennsylvania lawyer, scholar, and the designer of the Great Seal of the United States. 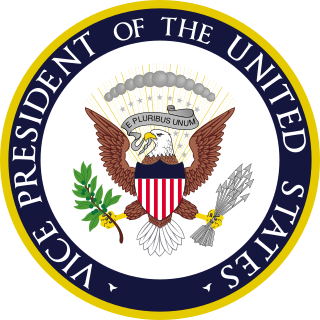 The Seal of the Vice President of the United States is used to mark correspondence from the U.S. vice president to other members of government, and is also used as a symbol of the vice presidency. The central design, directly based on the Seal of the President of the United States, is the official coat of arms of the U.S. vice presidency and also appears on the vice presidential flag. 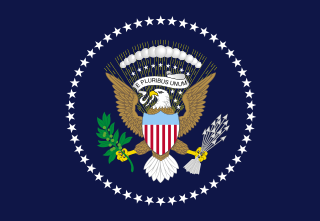 The Flag of the Vice President of the United States consists of the vice presidential coat of arms on a white background, with four dark blue stars in the corners. A version of the flag is kept in the Vice President's office, is sometimes displayed by the Vice President in official photos, and is flown on the Vice President's motorcade. The coat of arms of Mississippi is an official symbol of the state of Mississippi.